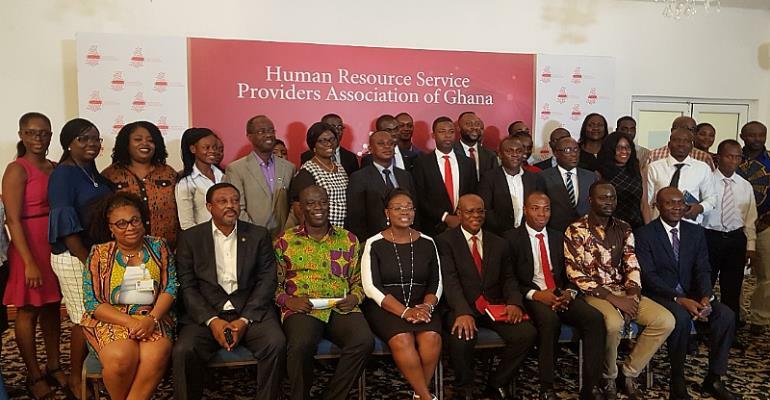 The Ministry of Employment in collaboration with HR Organizations have launched the Human Resource Service Providers Association Of Ghana (GHRASP) in Ghana to develop and promote high HR standards to share best practices in Human Resource Service Provision and Management in and outside the country. The gathering was first of its kind with the motive of unifying HR service providers for optimal performance in the world of work. In the opening address of, Dr. Mrs. Ellen Hagan, president of GHRASP and chief executive of L'AINE services, highlighted the evolution of HR in Ghana and the impact it has had on the world of work. Mrs. Ellen Hagan pointed out that, the core mandate of GHRASP is to, develop and promote high HR standards and share best practices in human resource service provision and management in and outside Ghana. According to her, "GHRASP intends to, among other things, be an advocacy group to positively influence government policies relating to human resource development and human resource service provision in Ghana", she said. She also acknowledged the establishment of governing executives that will direct the course of affairs and leadership under GHRASP and tasked the HR service providers congregated to come aboard this vision to ensure GHRASP excels in propelling HR in Ghana to the higher pinnacle. 1. To ensure compliance with professional ethics in human resource provision including ratified International Labour Organizations Standards, and the use of other lawful means to enforce a high level of service integrity, discipline. 2. To have an advocacy group to positively influence government policies relating to Human resource development and human resource service provision in Ghana and to promote members' interest. Influence public opinion and/or policy and demystify some of the perceptions around HR service providers. 3. To inform members of policies, legislation, growth opportunities, new developments and practices relating to human resource service provision in the country. 4. To confer, consult, communicate or cooperate with any other institution, society, association or body with a view to the pursuit of common objects in human resource services and related subjects and to represent the human resource service providers both nationally and internationally. 5. To enable and encourage all persons engaged in human resource service provision meet and correspond in other to facilitate the exchange of ideas and information on human resource service provision. The Minister of Employment and Labour Relations Ignatius Baffour Awuah speaking at the launch in Accra urged HR practitioners to equip themselves with modern technology to remain relevant in the sector. According to him, the fast emerging trends of technology compels professionals to acquaint themselves with technology to gain competitive advantage and meet international standards. He emphasised the government's belief in the role of HR in developing great economies and affirmed GHRASP's relevance in contributing to the government's vision. He then called on all stakeholders to rally behind the Association to help it deliver on its mandate.